Air Force Rings can be engraved for retired and active airmen. There are many options for designing these beautiful rings. They can be personalized with text and emblems relating to the airman. Name and rank and service dates can be engraved inside the band. Should the ring ever get mislaid, the personalization text will assist in finding the ring again. The United States Air Force is the envy of many and is considered one of the best trained. The discipline in the branch is second to none. Pilots are trained to land and take off from carriers while sailing. Most of us can remember seeing images of these brave men in action during campaigns in the Middle East and other combat zones. It is not at all surprising that the majority of pilots don Air Force Rings to display their pride and loyalty to this important branch of the military. Rings are priced to suit all budgets. The quality of engraving and texting is the same for all rings, it is only the choice of metal that creates the different costs. The best way to ensure your buying the correct Air Force Rings as a gift is to ask questions. Ask the person their ring size and their preference of metals. This can be done in a casual way. Finding the little details like his unit or special dates that has meaning. Information that is gathered prior to purchasing the ring, makes the designing process a lot easier. Gold Air Force Rings are mostly purchased for members who are retiring or have been recently promoted. 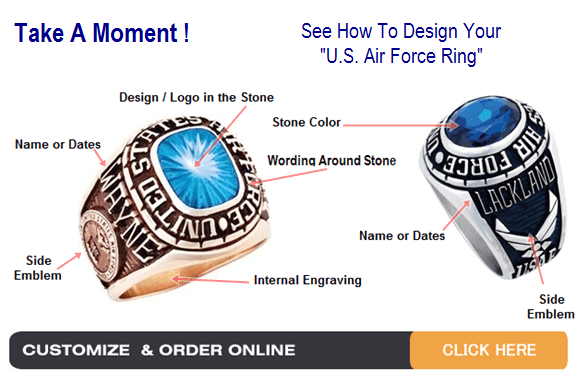 These rings are a much appreciated gift for any air force member to receive. The side emblem used for for custom air force rings are crafted with great care and detail. Medical Corps rings for men and women are very popular. The American flag is very popular also the Air Force emblem. We currently have one hundred side emblems to select from. As you can appreciate these rings are custom made using the detail you provide at the design stage in the shop. The company we use to create these rings process approximately 500 rings per week for the various military branches. We ask you to please allow 4-5 weeks for delivery. So order now today and avoid any delays ! We received the USAF Ring to day custom made with all the details engraved. We like it very much. The ring we ordered is beautiful. You did a great job on it and it arrived sooner than expected. Thank you very much. I will recommend your services to others.